center Should image be centered in container? header The heading in the control. imageAlignment Position of the image. top, middle or bottom, relative to the height of the text. Bootstrap 3.
imageHorizontal Position of the image. left or right. 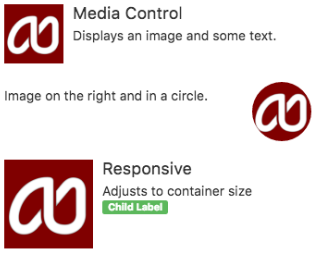 Bootstrap 3.
responsive Should image resize to container? src Filename of Image. Set to empty for none. Can be .png, gif, bmp or jpg. This page was last edited on 10 March 2019, at 14:52.